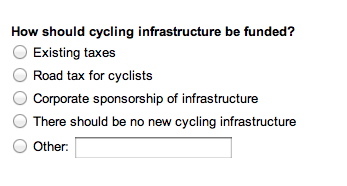 Who should pay for cycle infrastructure? No-brainer answer, really. Taxpayers should pay, and the money should come from the consolidated fund, i.e. the national coffers, as administered by the Treasury. This is how roads are paid for. All roads – including motorways – are paid for by all taxpayers. Many motorists believe there’s such a thing as ‘road tax’ and that it pays for building and maintaining roads and is a type of fee to use roads; cyclists are deemed to be “road tax dodgers” even though many cyclists also own cars and millions of motorists don’t pay for their car tax discs ‘Road tax’ ceased to exist in 1936/7 and even when it existed it paid for mostly road maintenance rather than the building of infrastructure. Infrastructure for the exclusive use of motorists wasn’t built until 1958 and was funded from the national purse. As motorists don’t pay directly for roads – vehicle excise duty and fuel duty goes straight into the consolidated fund – why should cyclists pay for cycle infrastructure? Do pedestrians pay for pavements? Infrastructure in the UK is paid for by the Government and local authorities, using monies raised by taxpayers. To suggest, even for a millisecond, that cyclists should be a special case and should pay for dedicated infrastructure is unworkable and unfair. 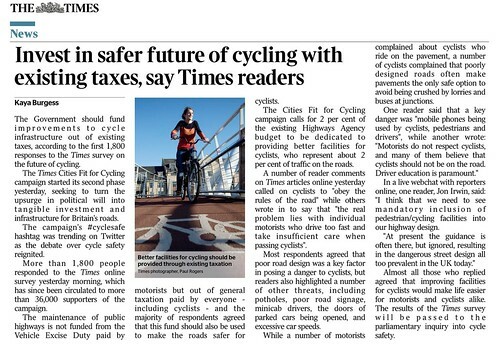 UPDATE 1: I DM’ed Kaya Burgess of The Times suggesting that ‘road tax’ wasn’t the best of terms to use and the phrase was quickly changed to ‘excise duty.’ My point still stands: cyclists shouldn’t have to fund cycle infrastructure and the whole question is spurious. The rest of today’s ‘cycle safe’ coverage in The Times is top-notch, as I reported last night on BikeBiz.com. The new parliamentary inquiry is especially welcome, and the appointment of Professor Phil ‘Peak Car’ Goodwin to write the follow-up report is inspired. I shall be submitting written evidence to this inquiry, seeking recognition that cycle infrastructure must be paid for out of the consolidated fund. Any talk of ‘road tax for cyclists’ or ‘corporate sponsorship of infrastructure’ is likely to lead us up the garden path. (I’m not against, say, the Nissan A19 cycle path but such sponsorship would ever pay for some go-use-the-path marketing, it would never be enough to pay for surveys, road building equipment, kerbs, tarmac, signage and on-going maintenance). Many people tell me that the issue of ‘road tax’ is small beer; that the ‘no pay, no say’ crowd is tiny and inconsequential; that criticising any parts of The Times’ brilliant cyclesafe campaign is snarkiness of the highest order. To that, I say the devil is in the detail: how to fund all the infrastructure being proposed by The Times will become a major issue. 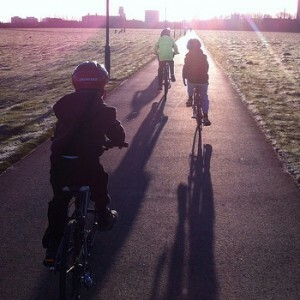 Let’s not get side-tracked by any talk of a special user-pays fund for cycle infrastructure. Proper cycle infrastructure, built to Dutch-standards, will cost billions of pounds. It’s national infrastructure, not infrastructure that could ever be paid for by users. Good point. But does that mean we should have toll booths on high-quality bike paths? Is that how Dutch folks got such great cycle infrastructure, users paid for it directly? No. Anyway, the M6 toll isn’t exactly a rip-roaring success, and pay-infrastructure, such as the Dartford Crossing or the Tyne tunnel, is rare. 99 percent of the roads and bridges built in the UK were paid for by taxpayers and general and local taxation should fund future cycle infrastructure. While a full-on, Netherlands-style cycle infrastructure would cost billions, over a number of years, this would still only be a fraction of what the Government happily spends on infrastructure for cars. As The Times rightly says “the bicycle is the future”. Some of the taxpayer cash that would have gone on cars should be diverted to measures that will tame cars, instead. This entry was posted on Monday, November 5th, 2012 at 2:01 am	and is filed under No such thing as road tax!. You can follow any responses to this entry through the RSS 2.0 feed.